a part of my personal makeup and official duties to monitor and register concerns to my superiors about efforts that harm, intentionally or otherwise, the Church and God’s people. they become outcasts from mainstream society and are marginalized from meaningful participation in public life. This brings me to the meaning of persecution. was the inevitable penalty. It is said that while torture was recommended by some to hasten the compliance of Fisher and More, the King’s conscience would not permit it. Nevertheless, when increased levels of persecution did not achieve the desired result of modifying the views of Fisher and More, martyrdom by beheading – rather than hanging, drawing, and quartering – was the inevitable solution. In the cases of Fisher and More, persecution came first, and then it was followed by martyrdom. In both cases, religious freedom was the target. I now turn to religious freedom. What is it? recognition, however, is often challenged by alarms registered by skeptics who question whether it is proper for there to be a public role for religion in civic life. She asks of you only liberty, the liberty to believe and to preach her faith, the freedom to love God and serve Him, the freedom to live and to bring to men her message of life. Do not fear her. She is made in the image of her Master, whose mysterious action does not interfere with your prerogatives but heals everything human of its fatal weakness, transfigures it, and fills it with hope, truth, and beauty. Humanae, Angelus Publication, 1966, p. 688.
protect them have a bearing on what is presently going on in the United States. Over the past months, we have heard much about the legitimate reservations raised by the United States Conference of Catholic Bishops that pertain to authentic religious freedom and the proper exercise of faith in public. The issues and reservations identified by the Conference’s president, Cardinal Dolan, about the health care mandate dealing with artificial contraception, abortion-inducing drugs, and sterilization are very real, and they pose grave threats to the vitality of Catholicism in the United States. But we must not forget the other perils to religious liberty that your great country has experienced in recent years. Once again, we see that the rule of law, in the context of your First Amendment and important international protections for religious freedom, has been pushed aside. Let me cite some examples of these other hazards. On other fronts, we have witnessed Catholic Charities across the United States being removed from vital social services that advance the common good because the upright people administering these programs would not adopt policies or engage in procedures that violate fundamental moral principles of the Catholic faith. Furthermore, we have observed influential members of the national American community – especially public officials and university faculty members – who profess to be Catholic, allying with those forces that are pitted against the Church in fundamental moral teachings dealing with critical issues such as abortion, population control, the redefinition of marriage, embryonic stem cell commodification, and problematic adoptions, to name but a few. In regard to teachers, especially university and college professors, we have witnessed that some instructors who claim the moniker “Catholic” are often the sources of teachings that conflict with, rather than explain and defend, Catholic teachings in the important public policy issues of the day. While some of these faculty members are affiliated with non- Catholic institutions of higher learning, others teach at institutions that hold themselves out to be Catholic. This, my brothers and sisters, is a grave and major problem that challenges the first freedom of religious liberty and the higher purpose of the human person. that saw the collapse of the modern Soviet totalitarian state. In his 1991 encyclical Centesimus Annus, John Paul reminds us that “totalitarianism attempts to destroy the Church, or at least to reduce her to submission, making her an instrument if its own ideological apparatus.”7 But he further noted that this threat is not solely expressed by the state established on dictatorship, for it can also be exercised by a democracy, for “a democracy without values easily turns into openly or thinly disguised totalitarianism.”8 Since the conclusion of the Second World War and the formation of the United Nations, democracies around the world have periodically exhibited traits of this new totalitarianism that emerges from a democracy-without-values, values that must be based on the timeless and universal moral principles adhered to and taught by our Church because these principles are founded on the Truth of Christ which came to set us free! 7 John Paul II, Encyclical Letter Centesimus Annus on the 100th Anniversary of Rerum Novarum, 45, (1991); cf, Second Vatican Ecumenical Council, Pastoral Constitution on the Church in the Word of Today, Gaudium et Spes, 76. 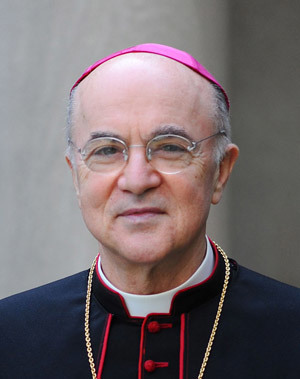 9 Eduardo Peñalver “Dolan to Lay Catholics: Be Our ‘Attractive, Articulate’ (and Unpaid) Flacks,” Commonweal Magazine, dotCommonweal blog (5 March 2012). is essential to authentic religious freedom because it is the means by which we fulfill the destiny of the human person. This entry was posted in FREEDOM OF RELIGION. Bookmark the permalink.